You won’t believe the amount of health that is in this dish… 5 TYPES OF VEGETABLES! Bak Choy. Broccoli. Mushrooms. Garlic. Onion. It is so good and healthy as a dinner meal. Plus, did you know that the humble ( and SUPER CHEAP ) Bak Choy has monstrous amounts of nutrients? Bet you didn’t know…right? This amazing dinner is sooooo EASY to make. Takes just minutes. It’s 5-STAR YUMMY and VERY LOW in calories. Cost-wise, it’s LESS than what you would spend in a restaurant. More reason to eat more, don’t you think? This recipe goes great with cooked quinoa. Click here to learn how to cook quinoa. You can add meat like chicken OR beef to this dish for extra protein and flavour. 1) Prepare the vegetables. Cut the bak choy and separate the stalks from the leaves. Set aside. 2) Next, chop the broccoli, onion, garlic and shiitake mushrooms. Set aside. 3) Place your pan/wok on the stove and turn the heat to medium-low. 4) Then, pour in the olive oil and the sesame oil. 5) Once the oils have been heated, add the sliced onion and garlic. 6) Saute the onion and garlic for about one minute. Then add the bak choy stalks and broccoli. 7) Add the water/broth/soy sauce to the pan and then add the mushrooms. 8) Lower the heat and cover the pan for 3-4 minutes. 9) Remove top and stir and add in the bak choy leaves to cook and the oyster sauce. 10) Once the bak choy leaves have softened, it’s time to serve! 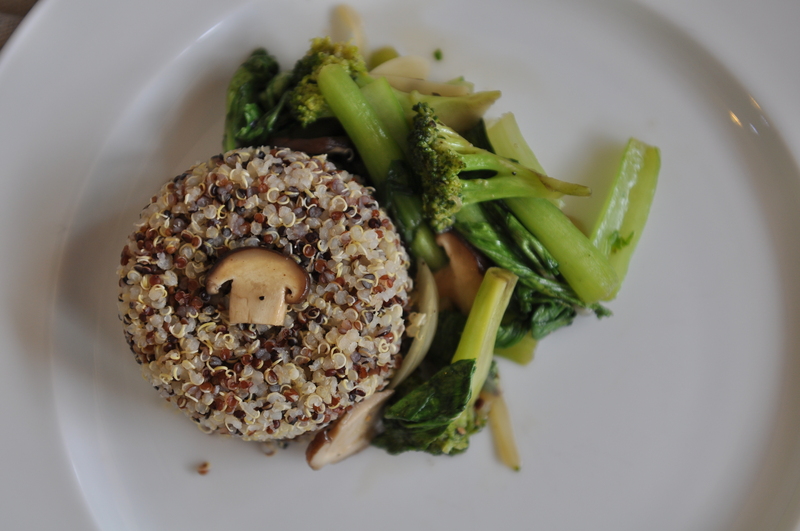 11) Serve the stir-fry on a plate OR on top of a bed of warm, cooked RESTORE™Quinoa. 12) Grab a spoon and ENJOY!